Safety is a major concern in all workplaces. August 2012 saw the High Visibility standard AS/NZS 4602.1:2011 come into full effect. To prepare for this Deane Apparel, Alsco’s uniform manufacturer, has worked closely with a consultant who served on the ISO committee tasked with updating these standards. As a result a new, fully compliant range of both Day and Day/Night garments is available. “The direct benefit to Alsco customers will be speed to market as the already taped and ready for dispatch range of Day/Night Vis garments has increased to a full range of both overalls and shirts and is now as wide as the Day Vis product line,” said Estelle Dean, Divisional Manager, Deane Apparel. So what is a Compliant Garment? Apart from the styling and placement of the retro-reflective tape which must comply with the guidelines specified in the standards, no garment is considered compliant unless it includes a label sewn into the garment stating compliancy with the 2011 publication and listing whether the garment is for Day or Day/Night usage. Logos are limited to no more than 50mm in height and Deane suggests the placement be limited to the locations specified in their posters. 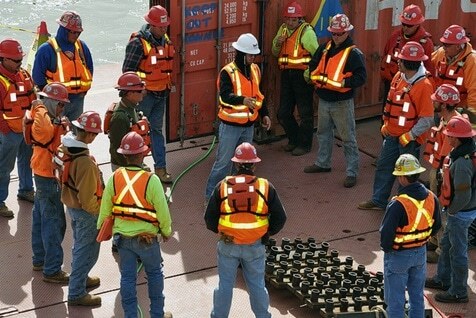 Talk to your local Alsco representative to discuss how these guidelines may impact on the high visibility uniforms required in your workplace. Call now!